1. Preheat the oven to 220°C, gas mark 7. Put the fennel, wine, olive oil and seasoning into a large roasting tin, toss well and roast for 15 minutes. Stir, then add the grapes. Cook for 10 minutes more, until the fennel is tender and the grapes start to split. 2. Meanwhile, put the walnuts onto a baking tray and toast in the oven for 5 minutes. Cool, then break into rough pieces. 3. 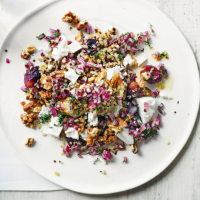 Cook the freekeh and quinoa mix in boiling water for 15 minutes, or until just tender. Drain, cool under running water, then drain again well. Set aside. Stir the onion into the red wine vinegar and extra virgin olive oil and then season. 4. When the fennel is ready, leave to cool for 5 minutes, before folding in the grains, cheese and nuts. Stir the dill into the pickled onions and spoon over the salad. Serve from the roasting tin.